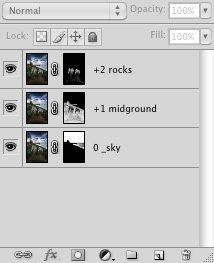 All Photoshops’ sharpening options have a common weakness, they apply sharpening values equally across the entire image. This forces us to make tradeoffs to find a honey-pot setting, the sharpening value that allows you to achieve enough contrast in some areas, without compromising others through introducing artefacts or halos. Through selective sharpening, you can selectively control the degree of sharpness to any area of the image, applying and fine tuning different degrees to different elements. Selective sharpening creates varying levels of sharpness with masks. With this sharpening workflow you can quite literally ‘paint-on’ a customised amount of sharpening to every element of your landscape. Now this tutorial assumes you are output sharpening, so all post-processing work would be complete and you have a final flattened digital file ready to open in Photoshop. Much like exposure bracketing, first we need to determine which areas of the image would best benefit from greater or lesser levels of sharpening. In this landscape photograph below, I defined 3 areas requiring different amounts of sharpening to get an optimal result. Using the bracketing number system is also good way to breakdown and navigate your image as well I’ve found. The highest sharpening is earmarked for the rocks and surrounding grasses as the images foreground focal point maximising contrast increase to gain the eye’s interest into the frame. Dialling down the volume a bit for the mid-ground, I’ve earmarked this for a general mid-level sharpen to provide some pop, correct for gradual lens softening in the wide angle lens used. The background sky is a naturally a softer element than the lower two thirds of the image, so I’m happy to reduce the level of sharpening here to a minimum compared to the rest of the image. Your folder stack should now look something like this. There is no difference to your standard sharpening workflow at this point, other than the fact that you sharpen multiple times -- 3 separate ones (or passes) in this instance. Exactly how you sharpen is up to you. 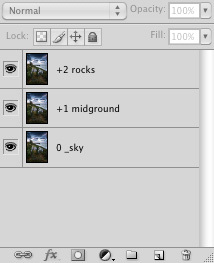 Photoshop offers many different ways of output sharpening, here I opted for the High Pass. Sharpen each layer with the desired level of sharpening, focusing attention the effects it’s having on the element you earmarked in that layer earlier. This gives you freedom to sharpen each element according to the value you feel is optimal for the item or area. Don’t sweat if other areas suffer; provided they are not in the area marked out in that layer we will paint those out later. With your sharpening setting applied to the whole layer we now need to go back and mask out the areas that we don’t want that setting applied to. Create a mask on each layer, and start masking out the elements on you want your sharpening level applied too. Your layer stack should start to look something like this. Going into my masks below, you can see I have masked off areas of the image to ensure the level of sharpening is limited to the elements I chose earlier. So in +2 I masked out everything but the rocks, limiting the most aggressive sharpen to that area alone. in +1 (mid ground) I masked out the rocks and sky, the rocks already having been sharpened on the layer above (+2), and masked out the sky to retain a level of comparative softness to all other elements. In 0 (sky), I masked out all two thirds of the image to reveal only the sky. Work your way down the stack till you are happy that the masks are blended accurately, ensuring there’s no areas where image sharpening is missing and the level of sharpen applied to each layer is as desired. Now each element in the image has a tailored sharpening value applied to it, ensuring that it sings in the final print, with no horse trading around gains in sharpness in one area to lose out to artefacts in another. We flatten the image, save a copy and we are done. Selective sharpening can be labour intensive. And the more areas you isolate the level of effort goes up, but the level of control gets around any compromises you might have had to make sharpening with 1 pass. Not all images are created equal so why apply equal amounts of sharpening?